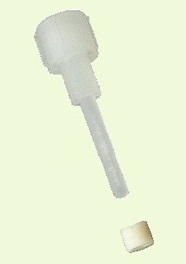 The resin driver acts like a syringe plunger and is screwed into the Resin Applicator Body. It is used as a piston to drive resin from the Resin Applicator Body forcing the resin under pressure into cracks in the glass. 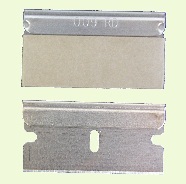 Note: the resin driver seals in the non threaded rubber seal in the lower area of the Resin Applicator Body. 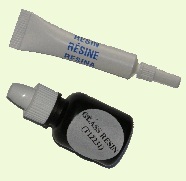 These Resin Containers contain a low viscosity UV activated polymer resin. 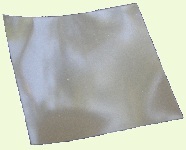 The resin's curing process is activated by exposure to UV light from the sun or UV lamp. The Dropper is used to allow transfer of small measured amounts of the Glass Repair Resin from the resin container to the resin chamber. The clear narrow tip of the dropper allows you to see the resin and then insert the dropper's narrow tip into the throat of the resin chamber before dispensing the resin.